Let’s see where we left off. Oh yes- the kitchen. 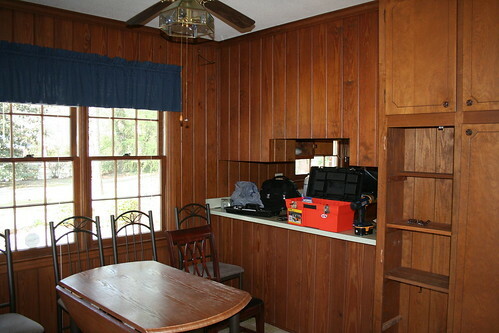 Here’s a picture of the breakfast area. You can see the toolbox that we had pulled out in order to replace all the doorknobs and deadbolts in the house. Little did we know that the only tool we ended up using was a hammer. Those things really did not want to leave the house! Luckily Matt was able to beat some sense into them. I was originally planning on taking this set of cabinets down but I didn’t really want to deal with repairing the ceiling just yet. It turned out much better than I could have thought. From there we move on to the den. This room really is going to be one of the most difficult I fear. We have a projector and I’m trying to figure out how to get it all set up. 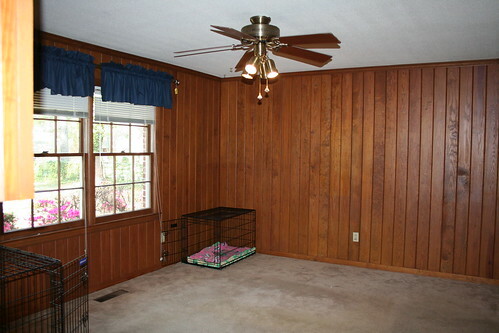 It will probably involve building some sort of unit on the wall the little dog cage is on. We’ll see how it turns out. A final picture for today- all the cabinet fronts all stacked and ready to be cleaned and primed. Coming tomorrow (or probably the next day as the husband is now home and wants to help- I’ve got him pulling up nail strips): Pictures of the breakfast area/kitchen/den in progress and (almost) finished! 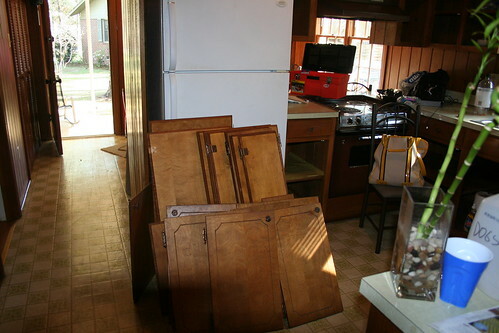 This entry was posted in Uncategorized and tagged I, kitchen cabinets, This Ugly House, yes my oven is coppertone. Bookmark the permalink. I’m dying to see the finished product! I hope you’ll include a “how-to” as well. 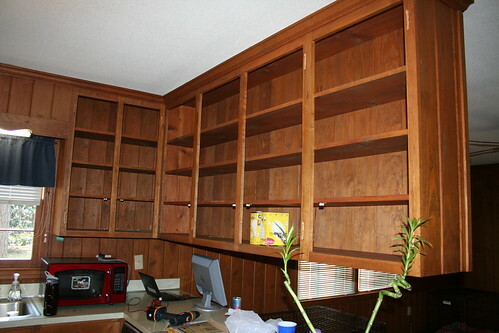 I need to paint my ugly cabinets too but the process seems a bit overwhelming right now.